An Indian Muslim man with Asperger’s syndrome takes a challenge to speak to the President seriously and embarks on a cross-country journey. I have watched My Name is Khan a few years back and I watched it again recently. I forgot about the story in detail, though I clearly remember what happened in the film. That’s why I decided to watch it again. My Name is Khan is one of the best films that you can possibly watch. The reason is simple. The moral lesson in this film is really good. You can definitely learn so much from it. Mostly it’s related to religion issue. With so many things happening not only in my country but like all around the world, this kind of film can teach us something that’s related to religion. I am not going to say much about it since I believe this is a sensitive issue, but I believe this film can teach us many things. I believe there are no bad religions, only the human. I don’t care what your religion is, but I believe no religion is wrong or bad. I believe every religion teaches us to be a good person. It all ends up with how people interpret the lesson. Every religion is good. It’s just the human that interprets it wrong and do bad things in the name of religion. And My Name is Khan has taught us much. Anyway, My Name is Khan is about a man with Asperger’s syndrome, Rizwan Khan, played by Shah Rukh Khan. He was a Muslim and being a Muslim in the United States after the September 11 attacks is not easy. So I heard and so does how the film explains it to us. Plus, Rizwan Khan is a man with Asperger’s syndrome, making everything more complicated than it already has. An Asperger’s syndrome is a developmental disorder characterised by significant difficulties in social interaction and nonverbal communication, along with restricted and repetitive patterns of behaviour and interests (source: Wikipedia). Rizwan Khan may have an Asperger’s syndrome, however, he is also very smart even when he’s just a boy. Most of the times, people will misunderstand him. Only his mother and his teacher have the patience to deal with him until he met Mandira, played by Kajol. This film basically teaches us that just because someone has some kind of disorder character, doesn’t mean he or she is unavailable to do things. We should never underestimate other people, judge them by their looks. My Name is Khan also teaches us not to judge people by their religion as well. Just because many people do bad things in the name of certain beliefs, doesn’t mean that everyone that holds the same beliefs is also a bad person and will act like those bad persons. I don’t know how many times, but My Name is Khan is the several time films that I’ve watched starring Shah Rukh Khan and Kajol. I used to watch Hindi films when I was a kid and that time, I didn’t really understand everything. Now that I have a better understanding and I think Shah Rukh Khan and Kajol are really really a great actor and actress. I’ve watched their other films again like Kabhi Khushi Kabhie Gham (2001) and trust me, I shed some tears. Scratch that. Not some, but a lot of tears. I think I’ll do a review about it later. Anyway, both Shah Rukh Khan and Kajol are so good. I can actually feel their emotion. Their chemistry looks so real that you will believe that there’s something going on between them in real life as well. 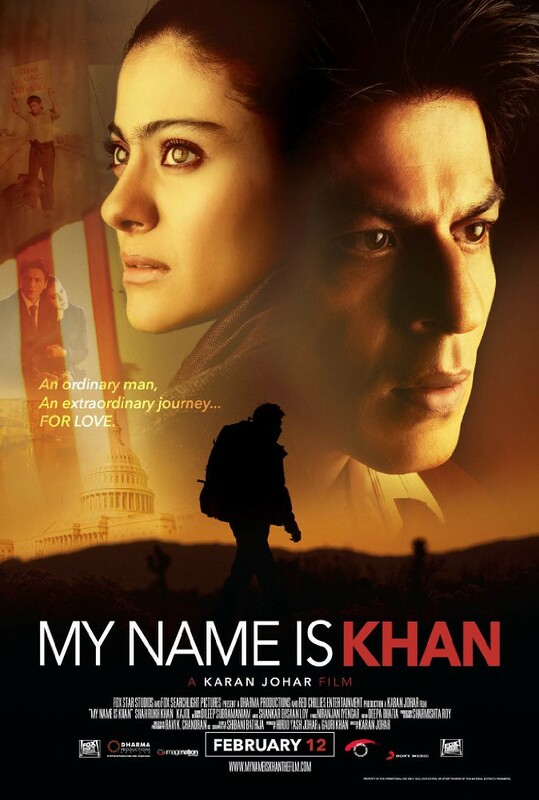 In My Name is Khan, Shah Rukh Khan played a man that has Asperger’s syndrome. It’s not an easy role do. I can’t compare whether being Rizwan Khan is harder or when Eddie Redmayne is playing Stephen Hawking in The Theory of Everything (2014) is harder. I believe you can’t really compare two roles because no role is the same, especially when you don’t experience the roles’ experiences. But seriously, I must praise Shah Rukh Khan. He isn’t called the King of Bollywood for nothing. His acting is so natural that it looks so real that you can either laugh or cry whenever you see him act. As Rizwan Khan too, Shah Rukh Khan studied about Asperger’s syndrome patients for months. And his hard work really paid off because he was excellent in this film. We should applause his totality. I can also say the same with Kajol. She’s such a great actress that you can actually feel the sadness when you see her cry. Even though her role as Mandira was not as difficult as Shah Rukh Khan’s because she played a normal person, but the emotion she put into her role is excellent and needed to be praised. Both Shah Rukh Khan and Kajol have made their chemistry looks really realistic. Since the story of My Name is Khan is pretty serious, I am so glad that no dancing and singing included in the film. At least not in a way an Indian film used to have. It’s not that their dancing is bad or the songs are not good, it’s actually otherwise. However, in a serious film such as this, I am so glad that they didn’t put any of those songs and dances in the film. We can more focus on the story because the story itself is already great enough and thought you so much. I give My Name is Khan 8.5 out of 10 stars.